I’m in New York. Again. This time it’s for Google’s AMP Conf, where I’ll be giving ‘em a piece of my mind on a panel. The conference starts tomorrow so I’ve had a day or two to acclimatise and explore. Seeing as Google are footing the bill for travel and accommodation, I’m staying at a rather nice hotel close to the conference venue in Tribeca. There’s live jazz in the lounge most evenings, a cinema downstairs, and should I request it, I can even have a goldfish in my room. Today I realised that my hotel sits in the apex of a triangle of interesting buildings: carrier hotels. Looming above my hotel is 32 Avenue of the Americas. On the outside the building looks like your classic Gozer the Gozerian style of New York building. 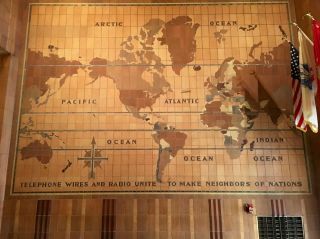 Inside, the lobby features a mosaic on the ceiling, and another on the wall extolling the connective power of radio and telephone. 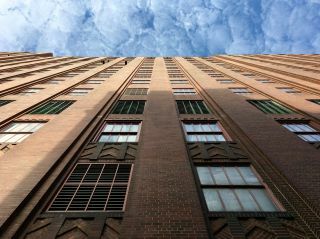 The same architects also designed 60 Hudson Street, which has a similar Art Deco feel to it. Inside, there’s a cavernous hallway running through the ground floor but I can’t show you a picture of it. A security guard told me I couldn’t take any photos inside …which is a little strange seeing as it’s splashed across the website of the building. 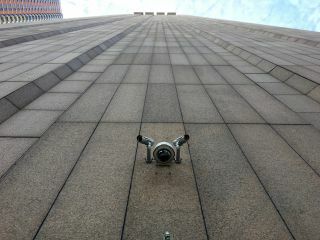 I walked around the outside of 60 Hudson, taking more pictures. Another security guard asked me what I was doing. 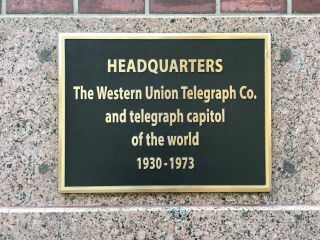 I told her I was interested in the history of the building, which is true; it was the headquarters of Western Union. For much of the twentieth century, it was a world hub of telegraphic communication, in much the same way that a beach hut in Porthcurno was the nexus of the nineteenth century. For a 21st century hub, there’s the third and final corner of the triangle at 33 Thomas Street. It’s a breathtaking building. It looks like a spaceship from a Chris Foss painting. It was probably designed more like a spacecraft than a traditional building—it’s primary purpose was to withstand an atomic blast. Gone are niceties like windows. Instead there’s an impenetrable monolith that looks like something straight out of a dystopian sci-fi film. 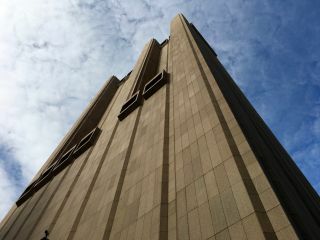 Looking at the building, it requires very little imagination to picture it as the lair of villainous activity. 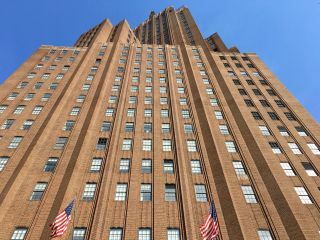 Laura Poitras’s short film Project X basically consists of a voiceover of someone reading an NSA manual, some ominous background music, and shots of 33 Thomas Street looming in its oh-so-loomy way. Armchair travelling to Ballardian locations.